Coming now to the serpent, it represents the devil, who certainly wasn't simple. That he was said, you see, to be wiser than all beasts is a figurative way of stating his slyness. 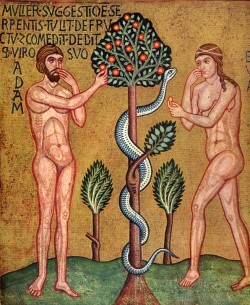 It does not, however, say that the serpent was in paradise, but that the serpent was among the beasts which God had made. 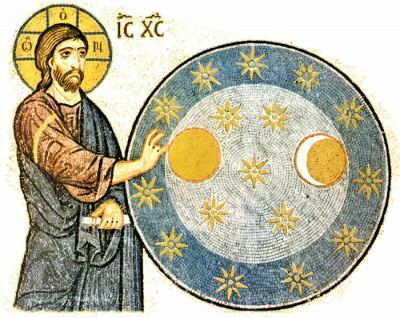 Paradise, after all, as I said above, stands for the blessed life of bliss in which there was no longer a serpent, because it was already the devil; and he had fallen from his blessed state, because "he did not stand in the truth" (Jn. 8:44). Nor is there anything strange about the way he could talk to the woman, though she was in Paradise and he was not; she was not in Paradise, you see, in a local sense, but rather as regards her blissful feeling of blessedness. Or even if there is such a place called Paradise, where Adam and the woman were actually living in the body, are we to understand the devil also making his approach there in the body? Not at all, but he made it as a spirit, as the Apostle says: "According to the prince of the power of the air, the spirit who is now at work in the children of unbelief" (Eph. 2:2). So then, he doesn't appear visibly, does he, to those in whom he is at work, or approach them by a kind of bodily movement in material places? No, of course not, but in mysterious ways he suggests whatever he can to their thoughts. These suggestions are resisted by those who can truly say what again the Apostle says: "We are not unaware of his wiles" (2 Cor. 2:11). How, in any case, did he approach Judas, when he persuaded him to betray the Lord? Not by local movement, surely, not in a way to be seen by him with these eyes? But of course, as it says, he entered into his heart (see Lk. 22:3; Jn. 13:2). The man will repel him, however, if he guards Paradise. God, you see, put the man in paradise "to work there and guard it" (Gen. 2:15). In fact that is what is said about the Church more or less in the Song of Songs: "A garden enclosed, a fountain sealed" (4:12), into which that persuader of perversity naturally does not gain admittance. But all the same he did take in the woman, because our reason too can only be brought down to consenting to sin, when pleasurable anticipation is roused in that part of the spirit which ought to take its lead from the reason, as from its husband and guide.